Fredrik TydÃ©n â€œTechniques and Technologyâ€œ (installation view). Photo: Jakob Emdal. One is immediately met by tinny audio that jars the compositional stasis of the exhibition. The sound emits from projection equipment placed on the floor, though the imagery emerges only reservedly; ill-lit and cast awkwardly onto black curtaining of a partition. The din is periodically feverish. Neither loud enough to decipher nor of suitable clarity, it makes itself undeniably present. This is The New Liturgy â€” a video looped for projection. The footage depicts the Borsa Valori di Roma* as appearing one evening last autumn, clad in large-scale digital projection. TydeÌ�n stumbled upon the occurrence and recorded it on his phone. The performance** illustrated a preoccupation of his practice â€” articulating an aesthetic formula akin to his own â€” facilitating the non-objective, compositional integration of technology through abstraction of form. Fredrik TydÃ©n â€œThe New Liturgy,â€� 2019 (video loop for projection [07:41] ). Photo: Jakob Emdal. 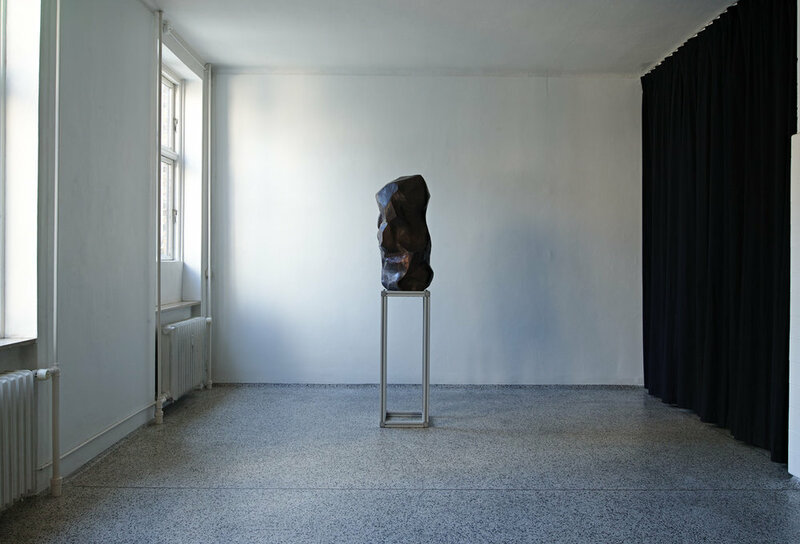 Fredrik TydÃ©n â€œThe Quiet Approach,â€œ 2019 (plaster, polystyrene, 132 x 134 x 9,5 cm). Photo: Jakob Emdal. The portion extending branchlike from the lower left corner of the plaster consists of segments in polystyrene that have been milled and marked with red and black inscriptions. They are sampled from a low resolution 3D-rendering of a juniper tree. The scale is 1:1. TydeÌ�n documented the specimen along the windy western coastline of Sweden. Perhaps the most popular of conifers used in ornamentation, the juniper in this case is digitally transformed and underscores a feedback loop in concrete materiality that takes precedence over any romantic narratives. TydÃ©n transmutes the virtual renditionâ€™s composite segments into a physicality, itâ€™s deconstructed and re-contextualised. An overlapping of systems, by which he models portions into alternate forms, resulting in the sculptures presented here. 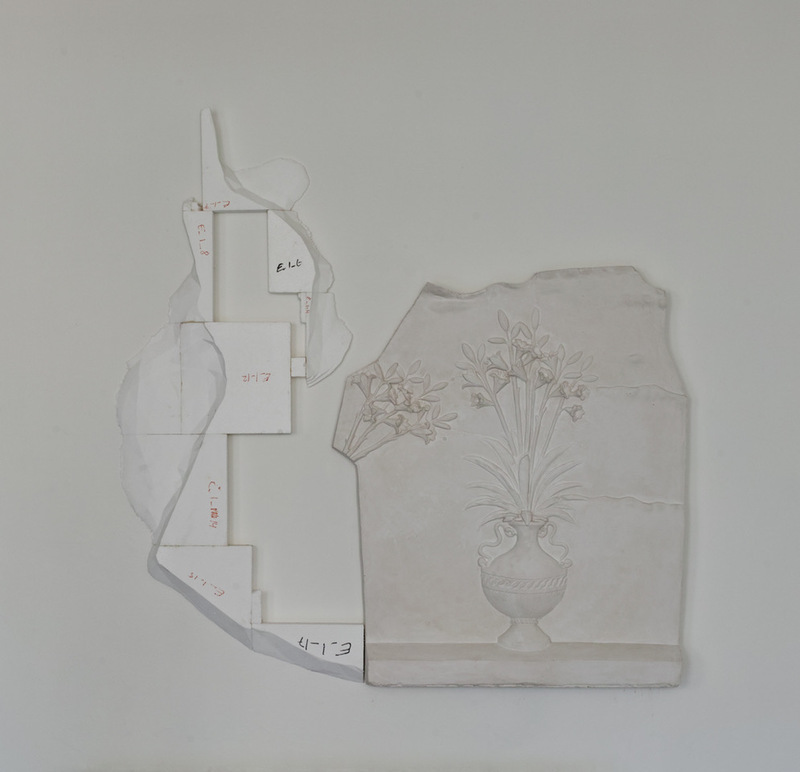 The piece positioned centrally within the space is titled The Fourth Alternative. In the spirit of homage, the Arkhitektons of Malevich come to mind, whereby ornament is decidedly non-figural and differentiates itself from form only by means of scale. Polystyrene, plaster and aluminum merge in stability and lightness. 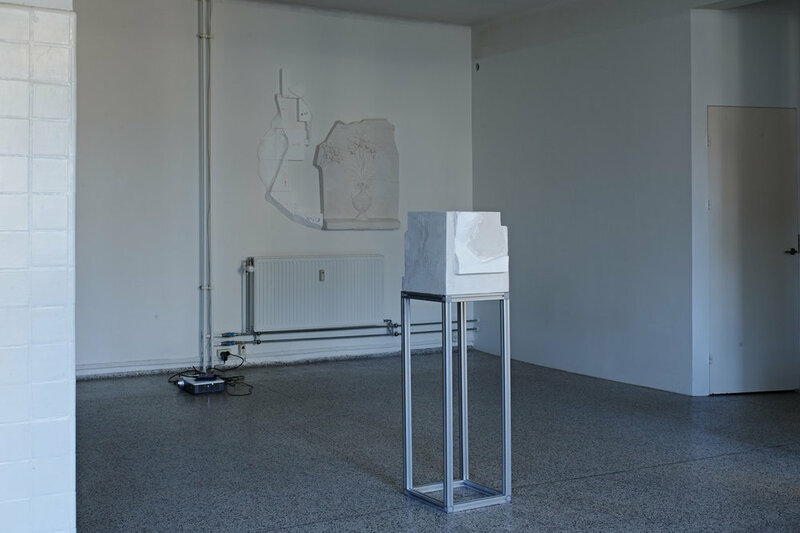 Fredrik TydÃ©n â€œThe Fourth Alternative,â€� 2019 (plaster, polystyrene, aluminum, 125 x 39,5 x 33 cm). Photo: Jakob Emdal. Considering titles, TydÃ©n browsed through late 1960s examples of the journal, â€™Progressive Architectureâ€™. The bronze sculpture on aluminum â€” addressing our attention by means of an unabashed deployment of modernist formal grammar â€” is titled E_1_12. In this case, the workâ€™s title reactivates the red and black inscriptions at play on the surface of The Quiet Approach. Borrowing from the system of labelling his renditionâ€™s archival files; it represents but a mere segment of the composite whole constituting the juniper. Exhibition period: 29 March - 11 May 2019. Opening hours: Monday and wednesday: 14-17, or by appointment. 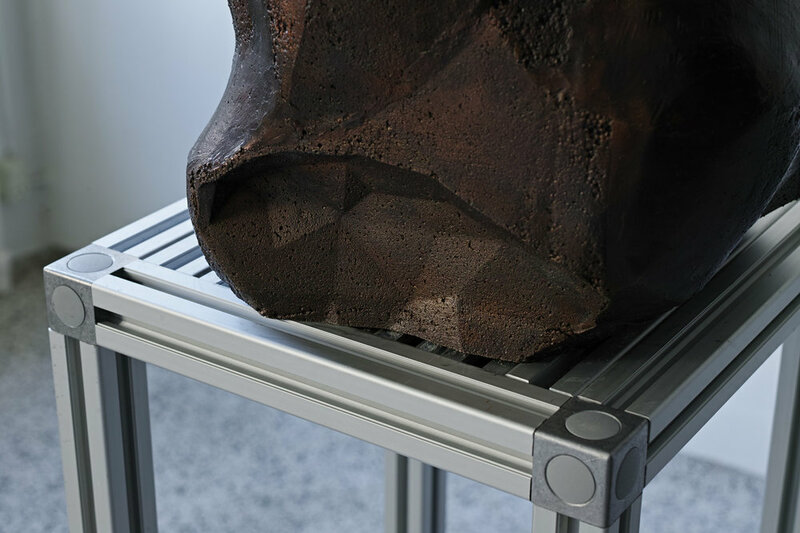 Fredrik TydÃ©n â€œE_1_12,â€� 2019 (bronze, aluminum, 188 x 41 x 43 cm, ed. 1/1). Photo: Jakob Emdal. * The Borsa Valori di Roma (Romeâ€™s stock exchange) is built on the the site of the Temple of Hadrian which was completed in 145 AD. Under the commission of Pope Innocent XII, Swiss-Italian architect Carlo Fontana completed a papal customs office on the same site, resulting in the building as it currently stands today with only 11 original temple columns remaining. ** 2018 marked the Solid Light Festivalâ€™s inaugural year in Rome; presenting six artists at six locations throughout the city Oct. 19-21st. TydÃ©n came across â€œThe driftâ€� by Romain Tardy (b. 1984, FR; with music by Loran Delforge) performed at the Piazza di Pietra at that time. *** Ospedale degli Innocenti (the Hospital of Innocents) was an early charity institution that cared for abandoned children. The original building was designed by Filippo Brunelleschi, with the first phase of construction under his guidance completed in 1427.